Did Halo delay Hulkenberg's escape after Abu Dhabi crash? 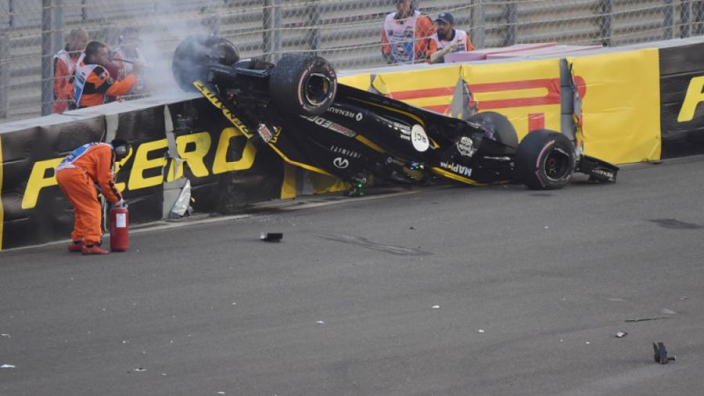 FIA race director Charlie Whiting has confirmed that Nico Hulkenberg's wait to escape his Renault after it was flipped upside down in a lap-one crash at the Abu Dhabi Grand Prix was not exacerbated by the presence of the Halo device. Hulkenberg clipped wheels with Romain Grosjean and was sent flipping through the air, before coming to a rest top-down against the barriers. The German was clearly concerned as a small fire emerged at the rear of the car, radioing Renault to say: "Get me out." Asked if there had been a delay in getting Hulkenberg out of his car, Whiting said: "Not at all. We knew he was okay. There's nothing to worry about there. "The routine under those circumstances is to put the car back on its wheels. Once the car was back on its wheels, which has to be done carefully of course, he was able to get out by himself. "It was very controlled from what I could see. Our medical delegate was more than happy with the way it was done. It all worked exactly as it should." Hulkenberg has been a staunch critic of the Halo since its introduction to F1, but was not in a position to criticise the device after Sunday's incident. "I don't know to be honest at the point if the Halo blocked me or not," he said. "On the right I had the barrier anyway and there was a very small gap. "Also when you are upside down it is not so easy to find all the buttons and all the things because everything feels very different. "It was not the most comfortable situation to be in. There was also a little barbeque at the back so I just wanted to get out but you feel pretty helpless in that situation but the marshals did a good job."